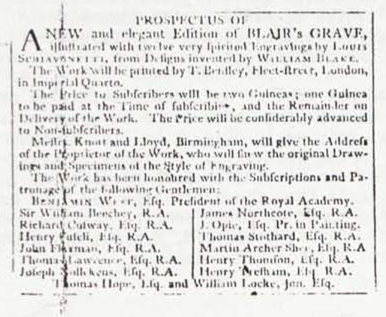 FINE ARTS—We have never experienced greater satisfaction than is announced to our readers, that there are now in this town, for the inspection of the lovers of the fine arts, some most beautiful designs intended to illustrate a new and elegant edition of Blair’s Grave. At a period when the labours of the pencil are almost wholly directed to the production of portraits, they who dare soar in the sublime regions of fancy surely claim the patronage of men of taste and discernment; and the specimens here alluded to may, with the strictest adherence to truth, be ranked among the most vigorous and classical productions of the present age. I do not know of any other exhibition of Blake’s work having taken place anywhere outside London at this early date. The list of subscribers printed in the book gives the names of sixty-six subscribers in Birmingham and the vicinity. The list suggests that the exhibition may have been circulated to other large centres such as Liverpool, Leeds, Wakefield, Manchester, Newcastle-upon-Tyne, Bristol and Edinburgh.